A vigorous grower that forms large clumps that will attract butterflies while repelling deer and rabbits, 'Windy City' is a fine choice for rock gardens, xeriscape gardens, or as a carefree edging to borders. Watering Details: Water during long dry spells. Overwatering can cause bulb rot. Fertilizer: Fertilize in spring and fall with an organic bulb fertilizer. 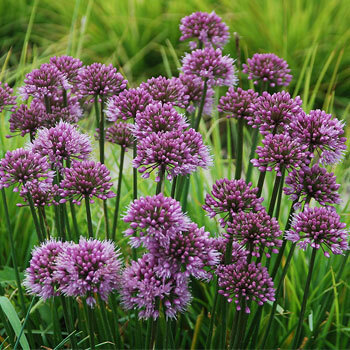 Diseases & Pests: Alliums are generally not susceptible to pests or diseases. Flowering: Flowers appear in dense ball shapes atop scapes. Seeds: Black, somewhat triangular seeds are produced in the flower ball but may be sterile or may not come true to type. Despite being members of the onion family, ornamental onions do not have a strong onion aroma.